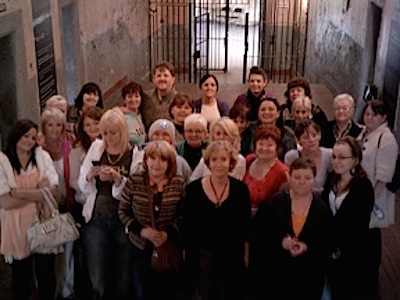 The experience of women during the Troubles has often been overlooked, especially those connected to Armagh Gaol. Now empty, it was the only female prison in Northern Ireland until it closed in 1986. The number of female political prisoners grew from 2 in 1971 to more than 100 by 1976; hundreds of women, most aged from mid-teens to mid-twenties, were jailed in the 1970s and 1980s for political offences. Republican women prisoners endured horrific abuse and violence and yet acknowledgement of that experience has been marginalised as have the unbearable pain and tremendous courage of mothers who were imprisoned. When the final key turned on a history many will never forget the stories of these prisoners seemed destined to remain unheard and unseen. ‘In the Footsteps of Anne’ fills the gap describing how young girls, married women, pregnant women and even grandmothers withstood horrific abuse and stood up to the British system which aimed at breaking them for over 30 years. Eileen Hickey, OC of the women prisoners from 1973-77, started compiling the inside stories from the women themselves over 10 years ago with the help of her sister Mary. Many ex-prisoners were reluctant to collaborate some because they did not want to re-live bad memories, others because they had put the past behind them. All the women who told their stories remembered some of the worst times, the inhumanity and petty vindictiveness and the incredibly strong bonds forged among the women in prison. Many recalled where their cells had been, and who their cellmates were. They remembered the protests and they remembered the beatings at the hands of the screws. Anne Larkin McCay was arrested at Easter time in 1967 for selling Easter lilies in Ardoyne (a staunch Republican area in North Belfast). 32 women were interned without trial - no charge, no sentence, indefinite imprisonment. For example, Ann Walsh O’Neill was interned in March 1973, Ann Doherty in June of the same year and Anne-Marie Williams in August. Marie Doherty went into prison as the protest by republican prisoners was escalating. “I was arrested in February 1977 and when I went into jail the political status had gone at that stage,” she said. “About six months after I was sentenced a shout went up one evening that there was chicken for dinner which was unusual because we never had chicken on a Tuesday. We all rushed down to the canteen and while we were there the screws moved in and penned us in and others went to search the cells. A riot broke out and we were all locked up for three days continuously with no access to toilet or washing facilities. That was the start of the no wash protest. Una Nellis says she went off the protest and felt really guilty and bad about leaving her comrades at that time in those conditions. She had a breakdown and ended up on so many different drugs, not realizing the damage they were doing to her. “There’s an awful lot of men and women suffering and they try to hide it as I do but our story should be told”. Republican prisoners in Armagh had close links with the men in Long Kesh. “There wasn’t a woman in Armagh who wasn’t writing to at least one man in Long Kesh. I shared a cell with the fiancee of Tom McElwee for three years and it was awful watching her, knowing that he was going on hunger strike. “We knew the first four who were going on and she knew at that stage that Tom’s name was on the list. For her it was not just being separated from him but she also knew what he was going through in Long Kesh”. Thomas McElwee started his Hunger Strike in the H-Blocks on 8 June 1981. He died on 8 August 1981. “I remember going to the funerals after they died. The thing that sticks out most in my mind was the funeral of Tom McElwee”. Jennifer McCann is a Sinn Fein politician who is a member of the Stormont Assembly. She was sentenced to 20 years for terrorist offences. In her time as a Republican prisoner she and her colleagues refused to work which meant they were locked up in their cells for most of the day. Jennifer McCann clearly remembers hearing that Bobby Sands had died on hunger strike in the Maze in 1981. In October 2009, a group of internees and sentenced prisoners began a journey to Armagh Gaol that some of them had only made once before, but which their families had made many times during their years of incarceration. At the end of the visit, the women were in the courtyard. I pointed out an intact window to Pauline Derry. “Be a shame to go without leaving your mark,” I said as I handed her a rock.